During the month of August 2018, most of the districts of Kerala, mainly, Iddukki, Patthanmthitta, Ernakulam, Trichur and Palakkad received more than expected rainfall (deviation by more than 164% as per India Meteorological Department (IMD) report) from this year’s South West monsoon. In just the first 20 days of the month, Kerala has received the highest rainfall for the entire month in 87 years, with Idukki district breaking a 111-year record for the highest rainfall for the month, as per IMD’s records. This rainfall has brought flood in several parts of the state. The state has faced this kind of disaster after nearly 123 years. More than 370 people lost their lives; thousands are stranded and huge property loss occurred. ISRO has monitored the whole event through its various satellites which helped a lot in the prediction and safety measures. ISRO not only extended support through its space based sensors, but ground based sensors as well. 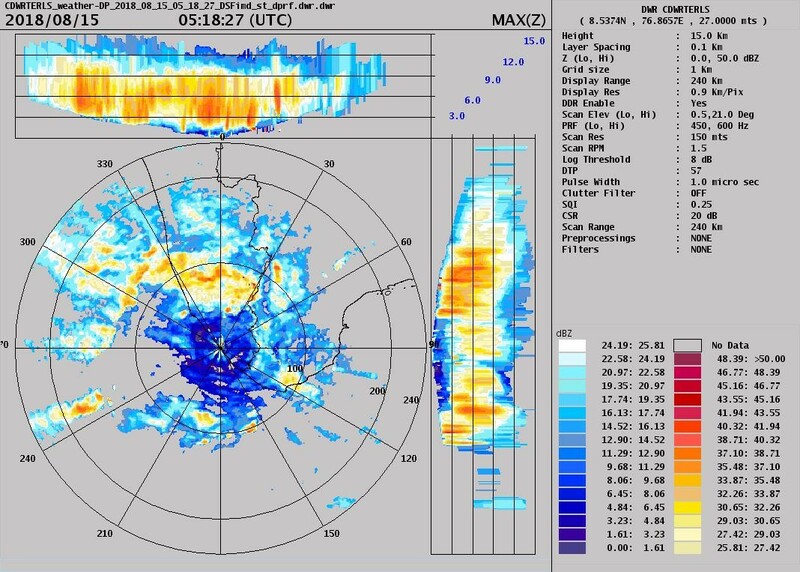 Two of its radars, one C-Band Polarimetric Doppler Weather Radar (DWR) at TERLS, Vikram Sarabhai Space Centre (VSSC), Thiruvanthapuram and one S-Band DWR at Kochi were continuously monitoring the weather on 24X7 basis up to 500 Km radius. 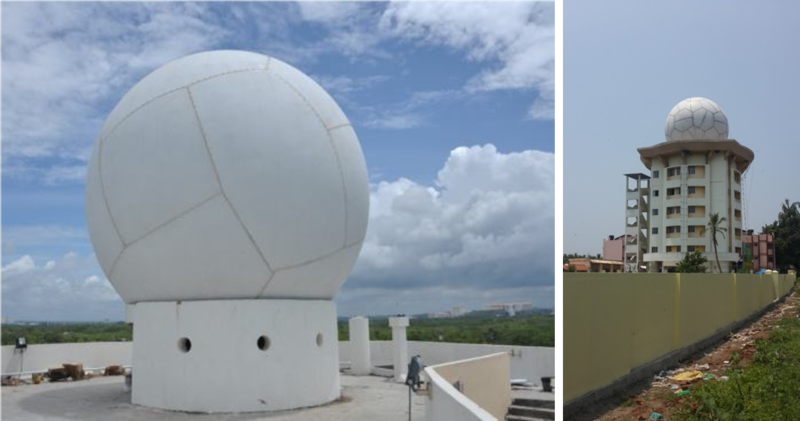 These radars were installed by Radar Development Area (RDA) of ISRO Telemetry Tracking and Command Network (ISTRAC), Bangalore. The data gets transferred seamlessly to IMD and MOSDAC (Meteorological and Oceanographic Data Archival Centre), Space Application Centre (SAC) immediately after each volume scan for further data analysis and centralised weather monitoring. The data is made available in near real time for public through the MOSDAC and IMD websites. 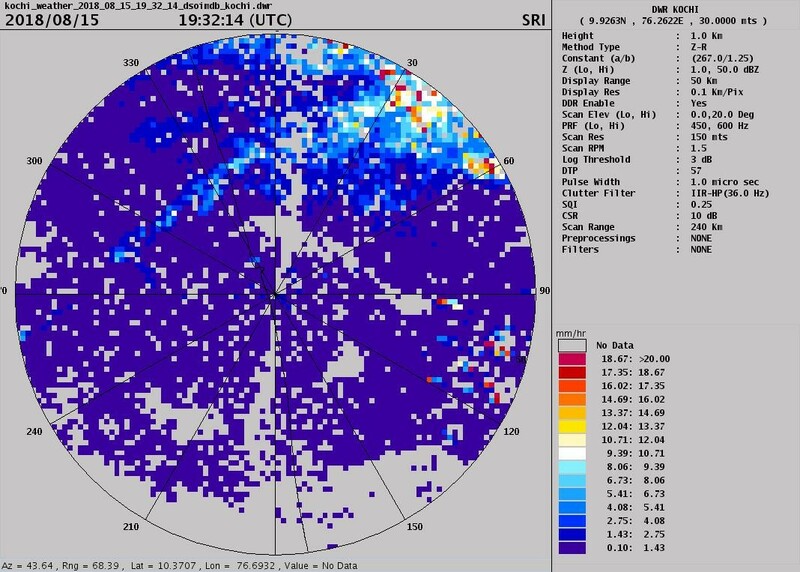 These radars helped a lot in long range weather surveillance, forecast and nowcast of the weather and rainfall activity in Kerala. 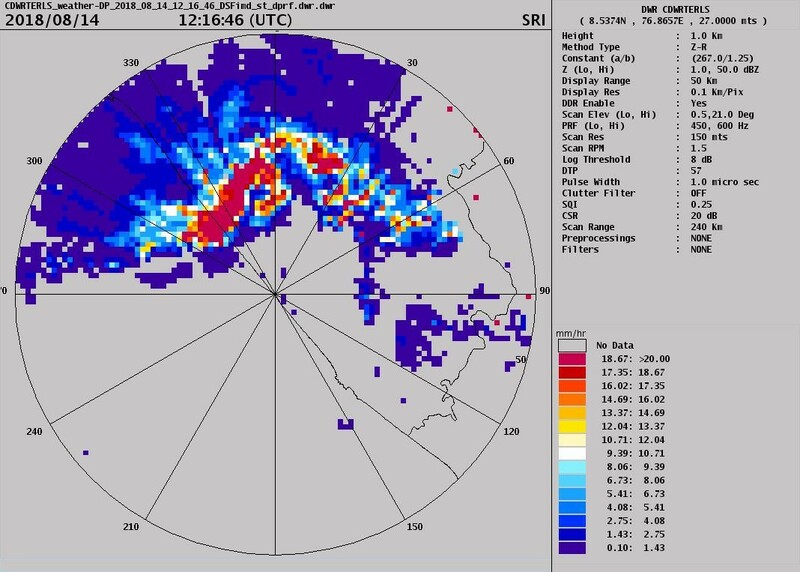 National Disaster Management Authority and Kerala state Disaster Management authority were continuously monitoring the data received by the radar and images were continuously updated in the IMD website for their decision making on various activities. The DWR measures radar reflectivity, mean radial velocity, and velocity spread to infer many aspects of hydrometeors. In addition to this, the Polarimetric DWR has the capability to measure additional four parameters, such as Differential Reflectivity, Correlation Coefficient, Linear Depolarization Ratio and Specific Differential Phase. These seven parameters provide accurate rainfall rate along with hydrometeor classification, such as type of rain by obtaining information of drop shape and size. 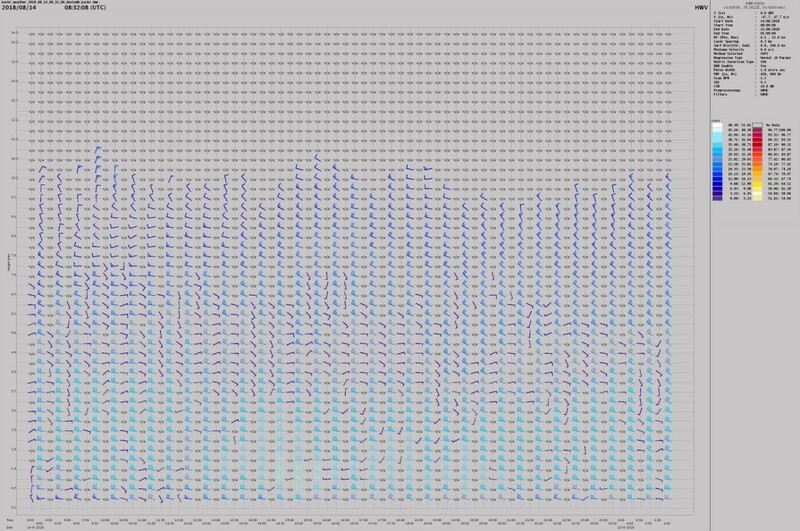 Thus the DWR system provides quantitative information in digital form, the intensity and mean velocity of cyclones along with rain fall rate and accumulation. 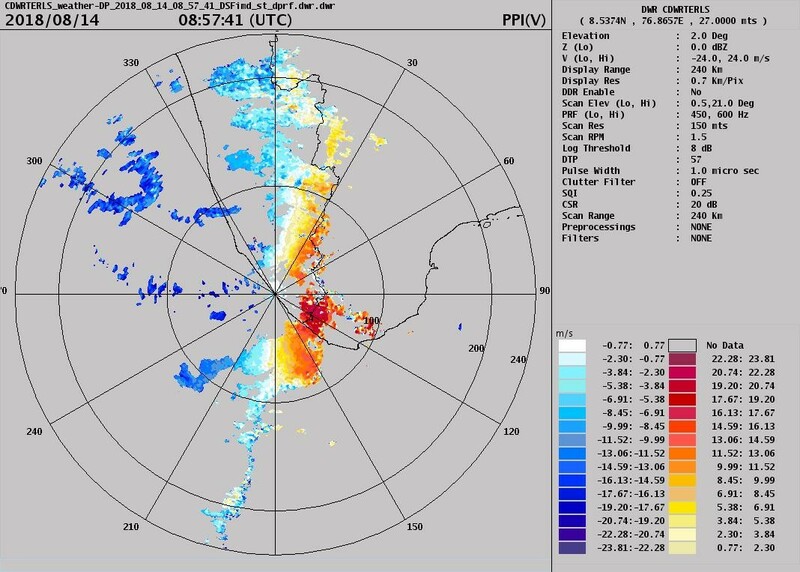 It improves the understanding and forecasting of thunderstorm, hailstorms, tidal wave height, wind turbulence and shear.The radar completes one volume scan in 11 minutes, comprising of 360 degree azimuth scan for 10 different elevation angles ranging from 0.5 to 21 degrees. 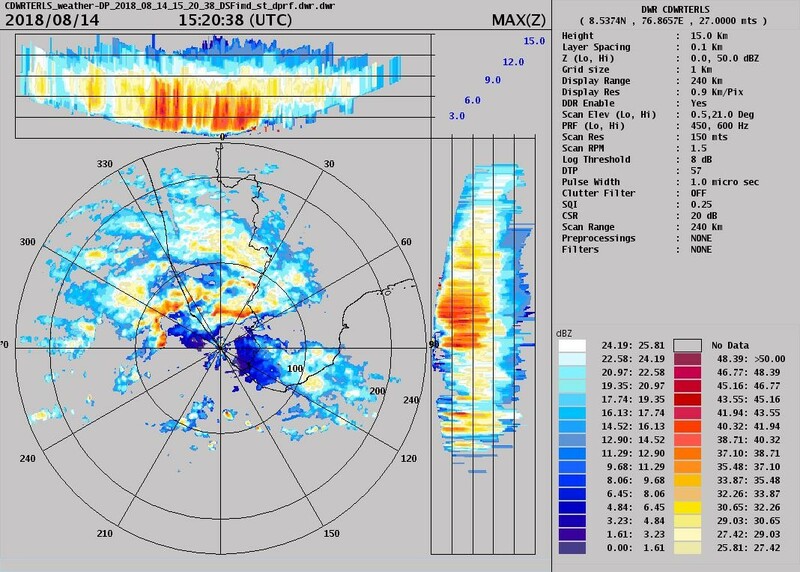 One of the products derived from the observation from the DWR is MAXZ, which shows the intensity of cloud system across the region of observation and height of the cloud system (in adjacent panels) giving an indication as to what could be the probable intensity of rain expected in and around the region. 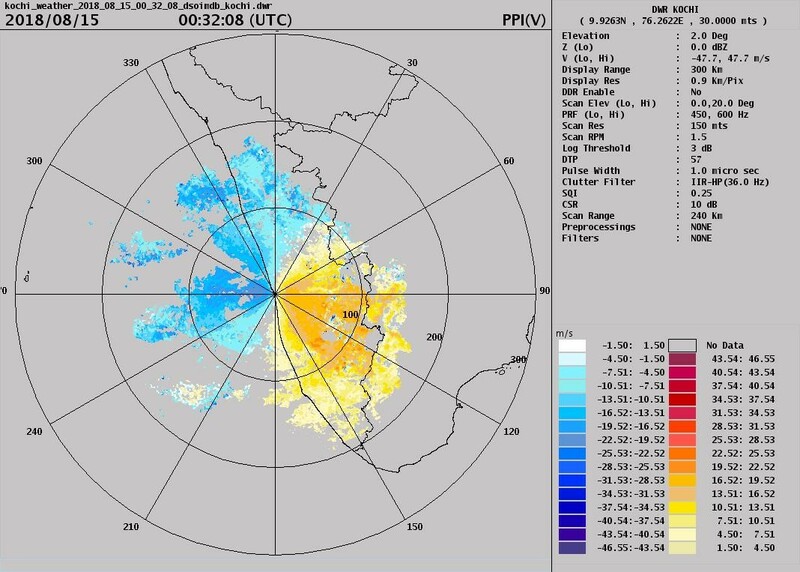 The DWR covers a distance of 250 km (up to 500 km for S -Band) with a spatial resolution of 150 or 300 m. Using these DWR products, weather forecast, nowcast and precipitation accumulation were derived in addition to other instruments’ data which helped the civic body in advance for evacuation and rescue of many lives and property. Both C-Band and S-Band radar is a ground based monostatic pulse Doppler radars. Some of the rainfall events captured by these DWRs during the floods are shown below.